The crowd is cheering, near deafening, vision blurry, exhaustion…then suddenly…lights out! Watching a boxer get knocked out is exciting and entertaining to everyone but him. We cheer, laugh, or become upset but we quickly return back to our lives. However for him, in most cases the fight has just begun. It’s one thing to be beaten, to KNOW someone got the best of us. We tried and trained, we prepared, but they somehow figured us out. They learned our system and exploited our defenses. Then with what seemed to come from out of nowhere…knockout! Love is pretty much like a heavyweight fight; from the initial butterflies and anticipation, to the feeling of the other person out and establishing a flow & rhythm. Next comes a flurry of emotional to controlled exchanges. This dance can seem like pure poetry or a savage encounter. All leading up to a euphoric moment of glory or a dizzy & sickening feeling of defeat. In the words of Teddy P, “Looks like another love TKO…” When love puts us down for the count, the road back can be more difficult than the KO itself. That feeling of doubt & question, second guessing our worth & abilities. It can make us question ever stepping in the ring again. How did this happen? Why? Even, what’s the point? These questions can and will run rampant in our hearts and minds. But like Rocky after catching that beat down by Mr.T in “Rocky III” we have to search within ourselves for that inner belief and strength to fight again. We have to train with the new found knowledge of how we lost the last time. Most importantly, we have to KNOW that we can win! Regardless of public opinion, rumors, lies, even taunts by the one who beat us, we need to fight on. Breakups can floor us much like an uppercut…even to the point of physically feeling like someone just knocked the wind out of us. It hurts and we're left dazed and confused. However, that pain like the 10 count will be over soon enough. We may have lost but we're not defeated. Now it’s all about the comeback. Putting ourselves back together. We know, yes it CAN happen. 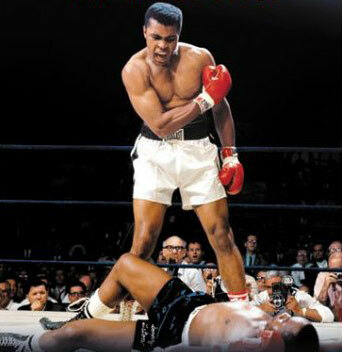 Even Muhammad Ali was beaten, and like him we can once again be champions! Love like boxing is not something we can enter timid or scared. Doubt & insecurity will eat away at us from the inside if we allow it. Losses will happen, we just have to take them on the chin and keep swinging. We can’t let that last fight cloud our judgement or hinder us in this battle. We need to remember that we are great, we are worthy. This is our fight to win!